Going into Monday night’s game, the last Cardinals walk off home run was David Freese in Game 6 of the 2011 World Series(Thank You Joe Schwarz). It had been a severely long time since the Cards hit a walk off bomb at home to seal a victory. Monday night, around the stroke of 11 p.m., Matt Adams cranked a two run bomb into the right field stands for the Cards to give them a victory and save them from potentially falling into fourth place. The big guy brought out the big stick, and let the big dog eat out of every bowl in the yard. Big City. Big Gravy. Big Smash. Big Country Fried Steak Rock Star. Give Adams a new nickname and I will just keep handing him bats to keep baseballs warm. 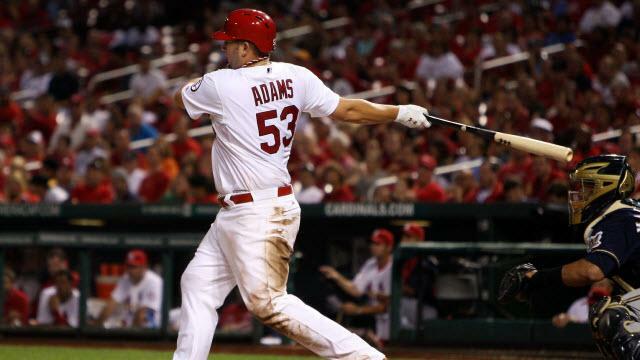 Matt Adams didn’t cure world hunger or end poverty as we know it on Monday night. He just saved the Cards from another pitiful loss. His home run didn’t save the season but it saved the many heart wrenched souls of Cardinal Nation for one night at least. Fans will be able to sleep sound tonight knowing the Big Man did his thing and secured a win for the Cards. The anemic offense was spared tonight by one mighty stroke. Ask around town and the Cards have a nice offense. Very polite and as threatening as a pack of poodles in one piece sweaters. They score in bunches, get shut down a ton and stage ill advised comebacks in the late innings that often don’t pan out. Their offense in 2013 was among the league leaders in runs, batting average, and hitting with runners in scoring position. In 2014, those numbers have been flipped. It’s more like leading the league in not doing anything well. The Cards hadn’t walked off since Greg Garcia was hit by a pitch back in May. For doing such a heroic Roger Dorn like thing, Garcia was promptly sent down. The Cards just can’t seem to get going in 2014. Hitting is at the root of their biggest troubles. Still, without a consistent offense and 3/5 of their rotation on the DL(two without timetable for return), the club is 48-42 on July 8th. Since this is the St. Louis Cardinals, the fans creep towards the ledge while being 6 games over .500. That’s this town. As Matt Carpenter stepped to the plate in the bottom of the 9th inning, I asked my twitter universe. When was the last time the Cards walked off with a home run? By the time I got my answer, fireworks were going off. It is amazing and sad that the last one to do it before Adams was Freese. That legendary extra inning playoff home run three seasons ago. You see, folks, that may be the problem with Mike Matheny. He hasn’t gotten a walk off home run yet while being manager of the Cards. All Mike needed was a little thrill at the end to finally come into sync as manager of a major league baseball team. If only it were that easy. For anyone thinking I am wrongfully bashing the manager, that was a joke. There are fragile people out there in Cardinal Nation and they must be taken care of. Before the Adams walkoff, the biggest tragedy of the night was my twitter feed. Depressing words about a missing lineup. No runs. A waste of another solid Adam Wainwright start. Inconsistency. Restlessness. “I am done with this team”. “I can’t take it”. “NOOOO!” I wasn’t far from that stage as a writer covering one of the most inconsistent most erratic team in years. Take away the Cardinals label. This is the team of Mad Men. Does this win cover up all the problems? No. The Adams walk off homer will dissipate rather quickly if the Pirates come storming back tomorrow and win. In order to truly convince fans things are getting better, the Cardinals must put together a streak. With the Bucs and Reds closing in and the Brewers not breaking down, the Birds can’t win a few here and there and hold off mediocrity. In order for a winning streak to come together, a few things must happen. Ironically, those things are linked to Matheny’s shortcomings as a manager. Here we go. *Stop Playing Daniel Descalso. He has 15 starts in 2014. That’s too many. He is hitting .181 and according to Bernie Miklasz’s column this afternoon, he has cost the team 16 runs at shortstop over the past three years. Descalso isn’t scrappy anymore. He’s crappy. DFA him. Call up Pete Kozma. Give me great defense when needed. With the Marlins series in the air, Matheny started DD on Sunday over the man who crushed a HR on Saturday in Jhonny Peralta. Matheny’s devotion to Descalso is worrisome. *Stop giving Peralta so much rest. He’s not Yadi Molina. Peralta has gotten two off days in the past 10 days. What gives? He is making big money to shore up a vital position. He is the best overall player on this team. He is among the best shortstops in baseball right now. Stop resting him, Mr. Matheny. It’s okay for the younger Peralta to rest but the older slumping Matt Holliday can’t buy a day or two off. *Don’t Sit the kid. Oscar Taveras doesn’t have to play everyday but he should start against righthanders like Charlie Morton. Taveras hasn’t been in the starting lineup 2 out of the last three games. With this offense being so lethargic, starting Oscar every day isn’t a bad idea. *Be willing to rest your closer. Two days later and I haven’t changed my opinion that was stated in the Saturday post game rant. Trevor Rosenthal can still be “the guy” and get an occasional save chance off. Look at Pat Neshek tonight in the top of the 9th. 12 pitches. 3 outs. It’s like he had 10 fingers on that baseball. Matheny loyalty running into hot waters this summer. This is a big time for Matheny. Things aren’t going right for the Cardinals so far. He is a young manager and natural born leaders should be at their best in the most turbulent of times. I am not saying it’s fair to compare Matheny to John Rambo out there, but there seems to be a trust there. The rest of this season will be interesting. Just to remind my readers. There are no off years in this town. So there are a few things about Matheny that worry me and could kill a potential winning streak. You see, that’s the reason writing sports commentary can be so draining. On a night where the home town slugger walks off, there are still dark waters to swim in. Will the Cards build off Monday’s thrilling victory or will they take two steps back tomorrow night? They won with three hits tonight and nearly wasted another strong Waino performance. That guy hasn’t allowed a run in 9 of his 18 outings this year yet only has 11 wins. With a better offense, Waino has 15 wins right now. That’s the problem. Runs scored. Consistency. Offense. Confidence. When will walk off home runs not be that far fetched for the St. Louis Cardinals? For now, forget all that though. Sleep tight. The Cardinals won. They are back on the horse. Moving forward. Towards better things. Right? Right?